Click here for conditions of commenting. Please do not comment on this post, it will be deleted. 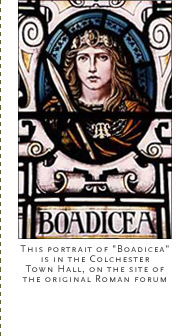 Boudicca (otherwise known as Boudica, Boadicea, Buduica or Bonduca) was the British, Celtic Queen of the Iceni of East Anglia. She is particularly remembered for leading a rebellion against the Romans after her husband Prasutagus died. If you have any information on Boudica please comment and include link(s). I would like to incorporate this information into the site. There seems to be scant information on her.